The star of 'Fifty Shades of Grey' is asking $3.195 million for his California mid-century modern. One of California’s most historic homes, the Peabody Estate, is for sale. Perched on a peak at the tip of Montecito with 360-degree views and several acres of gardens, it has been listed for $40 million. Frederick Forrest Peabody was a partner at Cluett, Peabody and Co., the manufacturer of the popular Arrow shirts, and was responsible for the big change in men’s fashion from rounded shirt collars to the pointed collar. Demi Lovato's L.A. Home, where she overdosed in July, is for sale asking $9.45 million. Demi is trying to put her past mistakes behind and decided to sell her four-bedroom, six-bath home with city views, chef's kitchen and sky lounge. Dale Earnhardt Jr. and wife, Amy, purchased a Key West home in 2015 for $1.2 million that they remodeled in a four-part series on DIY, a part of the HGTV network. Recently on the market, the 150-year-old, three-bedroom home is priced at $2.6 million. The Albuquerque home where the final scenes of 'Breaking Bad' were filmed is for sale at $2.5 million. The 5,900-square-foot contemporary includes four bedrooms, cabana and pool on two acres. It was the fictional home of Walter White's college friend who parlayed Walter's research into a billion-dollar company, but left Walter out of the money. Cher's first serious home after her divorce from Sonny Bono, which she designed and had built in Beverly Hills in 1980, is now on the market at $68 million. As her career and personal life advanced, Cher eventually sold the property to comedian-actor Eddie Murphy in the late 1980s. He held on to it until 1994 when new owners took over and turned the property into a 14-acre equestrian estate – the last compound of its size in Beverly Hills. Warren Buffett has a good eye for real estate. In 1971, Warren bought a contemporary-style beach home in Laguna Beach for $150,000 – long before prices there began to skyrocket. He has had the six-bedroom home listed for over a year at $11 million, but recently cut the price by $3.1 million, now asking $7.9 million. All rooms, including the large family room and decks, have ocean and beach views and the rock cliffs spilling onto the beach of Emerald Bay. Warren's main home is in Omaha that he purchased in 1958 for $31,500. Florida continues its real estate climb from the 2008 – '11 real estate crash as prices and sales have increased for 79 straight months. The median price for a single-family home in July, 2018 increased 6.3 percent to $255,000 while Florida condo median prices rose 5.3 percent to $180,000. The U.S. national median price was $279,300 for single-family homes and $258,100 for condos. Craig Newmark’s former San Francisco home, the place where he created, developed and operated Craigslist in the mid 1990s, is for sale asking $1.39 million. The early 1900’s-era, 1,250-square-foot, three-bedroom, one-bath triplex home was purchased by Craig in 1994, just a year before starting Craigslist, and where he lived for six years. Meryl Streep has listed her New York City penthouse for $24.6 million. Meryl bought the Tribeca four-bedroom home with Hudson River and Manhattan views in 2006 for $10.13 million. 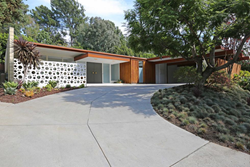 Meryl and husband, Don Gummer, recently moved to a California mid-century home they bought for $3.6 million.